The new Berg FlatGround Champion is a floor trampoline of extra class. The approved quality of the Berg Champion trampolines is combined with the new Airflow jumping mat for an even more comfortable jumping. The FlatGround lines up precisely with the lawn, so the trampoline can be attractively integrated in the garden and it is easy to get on. Jumping on the FlatGround Champion is almost noiseless, because especially absorbing straps are built in the protective edge, which avoid the flapping of the protective edge. The especially large protective edge is very long durable thanks to the weatherproof PVC. The patented frame is easy to mount and easy to be embedded in the ground. 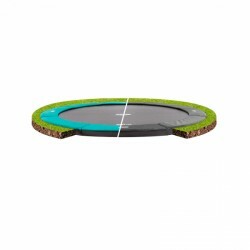 The desing of the floor-level trampoline also integrates perfectly into the garden. In addition, getting on is quite easy. The trampoline FlatGround Champion is available in green or grey. Berg trampoline FlatGround Champion add to comparison list.